The marriage of Isabella, sister of Henry IV of Castille, and Ferdinand, son of John II of Aragon occurred in 1469. The marriage was politically complex and driven largely by John's ambition to unite Spain. In 1474, Henry IV died, and Isabella proclaimed herself queen of the very powerful Castile. She did this by declaring that Henry IV's daughter Juana was illegitimate. In the same year John II died and Ferdinand became the King of Aragon. In addition, he ruled over the Spanish states of Valencia and Catalonia. The first thing they did was restore order. Feudal violence and banditry had transformed cities into battlefields. They began by asking the support of the middle class. Next, they hired a police force which was called the “Santa Hermandad.” They and Isabella and Ferdinand's tribunal system handed out immediate punishment until peace was restored. Gradually, they assumed control of the towns and cities. They did this by making political and ecclesiastical (church) appointments. Also, they instituted sales taxes and a 1/3rd tax on all tithes paid to the church. In addition, Ferdinand and Isabella took control of imports and exports, including gold and silver. Shipbuilding thrived under their leadership. The Crown, promoted trade and industry. Even offering direct subsidies to domestic shipbuilders. Spanish architecture, sculpture, and literature developed its own style. By the year 1500, Isabella, Ferdinand, and the Spanish nobility owned 95 % of the land, and because they owned all of the land the remaining peasants lived in dire poverty. To make things even worse the Spanish Monarchs did a poor job of managing their agricultural holdings. Instead of growing agricultural crops, the Crown encouraged wool production. As a result, there were chronic shortages of food. 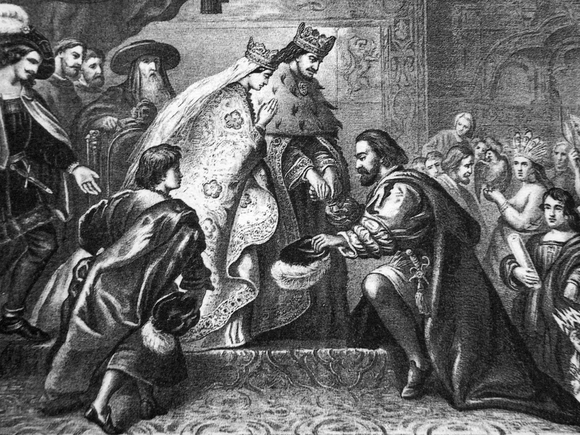 Columbus had tried to pitch the idea of a western voyage to John II of Portugal, but his group of experts advised the king to refuse financing. Next, Columbus would turn to Ferdinand and Isabella who would also turn him down. It would take 8 years of delays and negotiations before Isabella, and Castile agreed to finance the “Enterprise to the Indies.” Before his departure, she named Columbus viceroy, admiral, and governor of all land discovered. He was also granted a portion of the profits. From the very start Isabella would fight against the enslavement of Native Americans. However, in the end her opinion had little effect. Ferdinand and Isabella pursued religious and unity under one religion, Catholicism. After they conquered Granada, Pope Alexander VI awarded them the title of “The Great Catholic Sovereigns.” As Catholic Monarchs they expelled both the Jews and the Muslims. They told them to either become Christians or leave the country. At the same time, they ordered them to leave their money behind. Isabella died in 1504. In her will, she named her daughter Juana her successor. However, Juana was mentally unstable and unsuited to rule, so Ferdinand remained in control until his death in 1506.